The canton of Basel-Landschaft (German: Kanton Basel-Landschaft (help·info), English: canton of Basel-Country, French: canton de Bâle-Campagne, Italian: Cantone di Basilea Campagna; informally: Baselland, Baselbiet), is one of the 26 cantons of Switzerland. The capital is Liestal. It shares borders with the Swiss cantons of Basel-Stadt, Solothurn, Jura and Aargau, and with the French région of Grand Est and the German state of Baden-Württemberg. 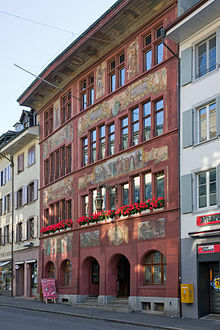 In Roman times, the area of Basel was a centre of Roman activity. There are well-preserved remains at the site of Augusta Raurica in the canton of Basel-Landschaft. Around 200 AD there were about 20,000 people living in this city, now part of the much smaller Augst. The remains are on display in an open-air museum. The museum attracts over 140,000 visitors per year. Many of these visitors are schoolchildren from other parts of Switzerland. The site of Augusta Raurica includes the best-preserved amphitheatre north of the Alps, and a reconstructed Roman villa. The canton of Basel-Landschaft lies in the northwestern corner of Switzerland just south of the canton of Basel-Stadt. With a few exceptions, it includes the towns of the Laufental along the river Birs, the Birseck and the Leimental, as well as the towns along the Ergolz and its tributaries. The shape of the canton is very irregular, and its borders cut across several towns. In terms of size, it is one of the smaller cantons of Switzerland (18th of 26). However, it is number 10 in terms of population. On the south, it borders on the canton of Solothurn, with a few exclaves of that canton within its western area. In the extreme southwest, it borders on the canton of Jura. The Jura mountain chain traverses the canton. The rivers Ergolz and Birs drain the lands of the canton. Former town hall in Liestal, the cantonal capital. There are 86 municipalities in the canton (As of 2009[update]). The population is predominantly German-speaking. Protestantism is the main religion in the canton (43% as of 2000[update]), while about one-third of the population (32%) is Roman Catholic. The Swiss Reformed Church and Christian Catholic Church of Switzerland are recognized as state churches. Between 1959 and 1970 the canton was Switzerland's fastest-growing, as the population almost doubled from 108,000 to 205,000. Today, the canton has a population (as of 31 March 2017) of 288,660. As of 2007[update], the population included 48,719 foreigners who made up 18.1% of the population. Basellandschaftliche Zeitung, daily newspaper published in Liestal. ^ Nationalratswahlen: Stärke der Parteien nach Kantonen (Schweiz = 100%) (Report). Swiss Federal Statistical Office. 2015. Archived from the original on 2016-08-02. Retrieved 2016-08-04. 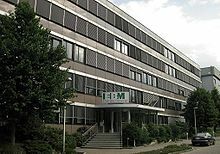 ^ Federal Department of Statistics (2004). "Wohnbevölkerung nach Religion". Archived from the original (Interactive Map) on 2008-12-29. Retrieved 2009-01-15. Wikimedia Commons has media related to Canton of Basel-Landschaft. Canton of Basel-Landschaft in German, French and Italian in the online Historical Dictionary of Switzerland.